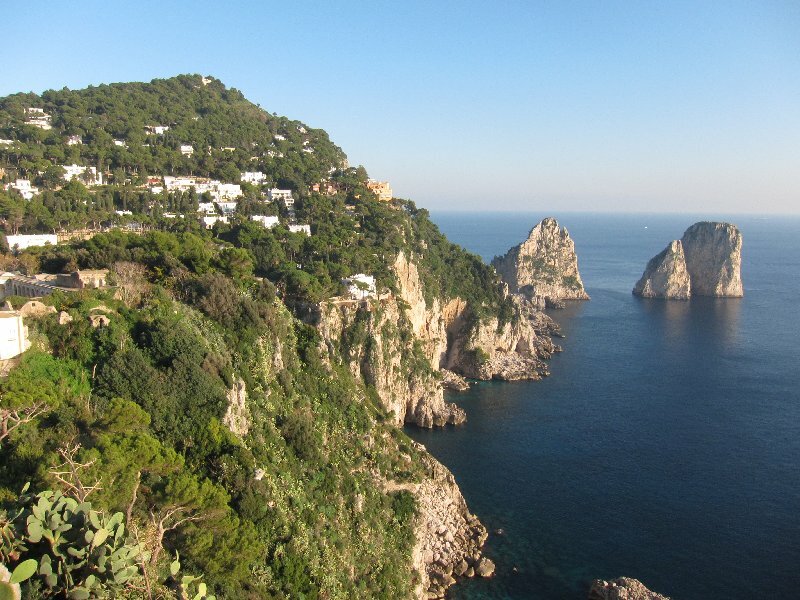 Capri is my husband’s favorite place and I have to agree that the island’s beauty is indisputable. Unfortunately what Capri has become, at least in the centro, is a high-end tourist location for the very wealthy. No characteristic, artisanal items on sale here; what you’re most likely to find are the top designers, and costly jewelry & gift items. So why do we keep going back to Capri? It is so spectacularly beautiful and once you get out of the center you can walk and hike for hours and every turn you make reveals another view of unparalleled beauty. 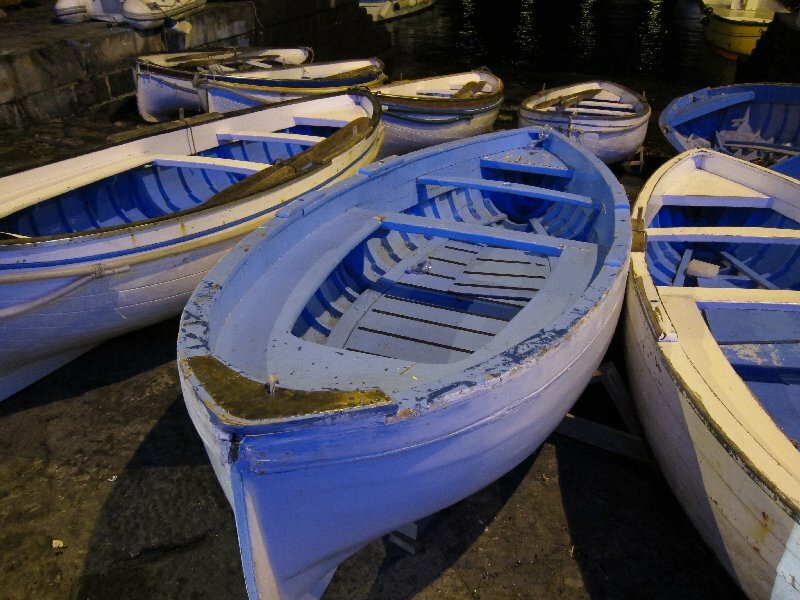 We loved these old, blue row boats at the end of the port area which is mostly frequented by fishermen. 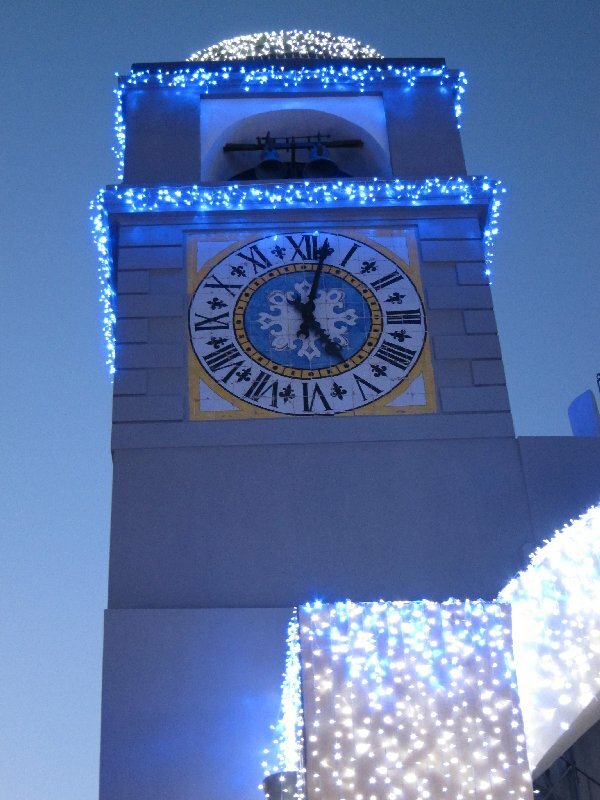 The last Sunday of November Capri was almost a ghost town. Normally we would already be well into winter and the likelihood of getting an aliscafo from Naples to the island unlikely. Instead, it was a gorgeous Indian summer day….and the island was ours for the taking. 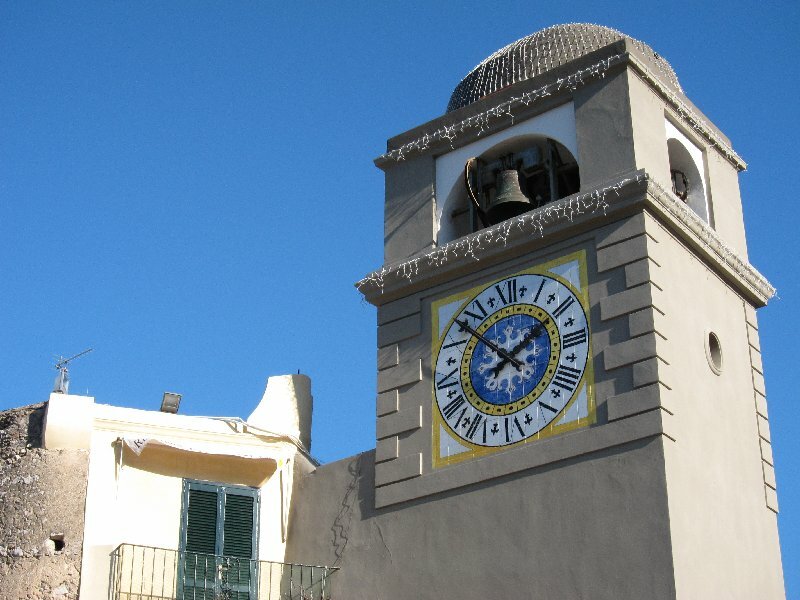 When you first get to the main square following the funicular ride up the mountain the characteristic view is the ceramic clock. 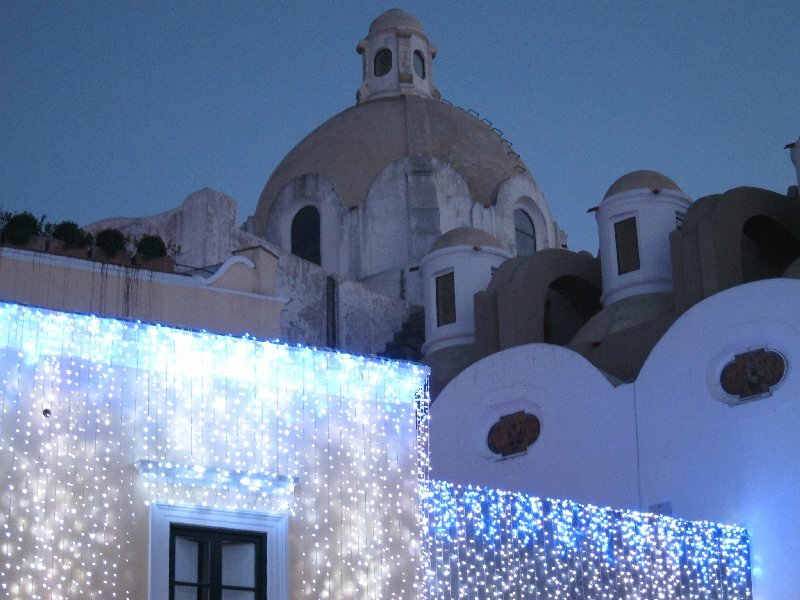 After we’d spent the day hiking and were ready to return to the mainland it was already getting dark and the piazza was transformed, glowing with Christmas lights. The piazza was magical and almost fairytale-like. 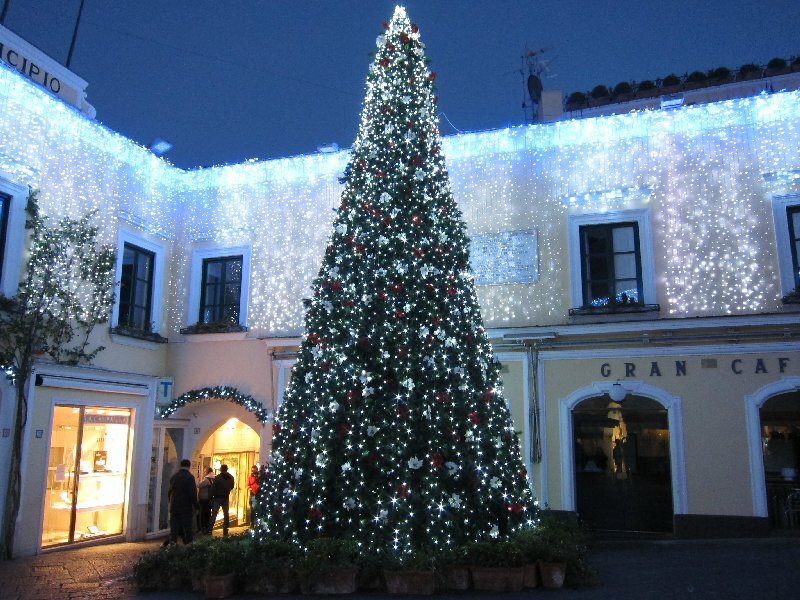 A gorgeous Christmas tree had become the focal point of the piazza. 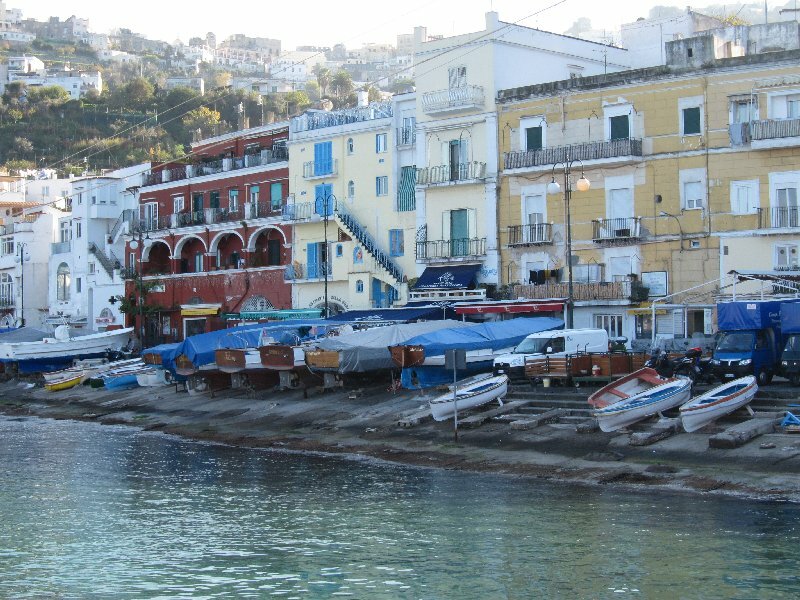 When we arrived on the island in the morning we first walked around the port area and enjoyed all the colors and the view up into the hill town of Capri. 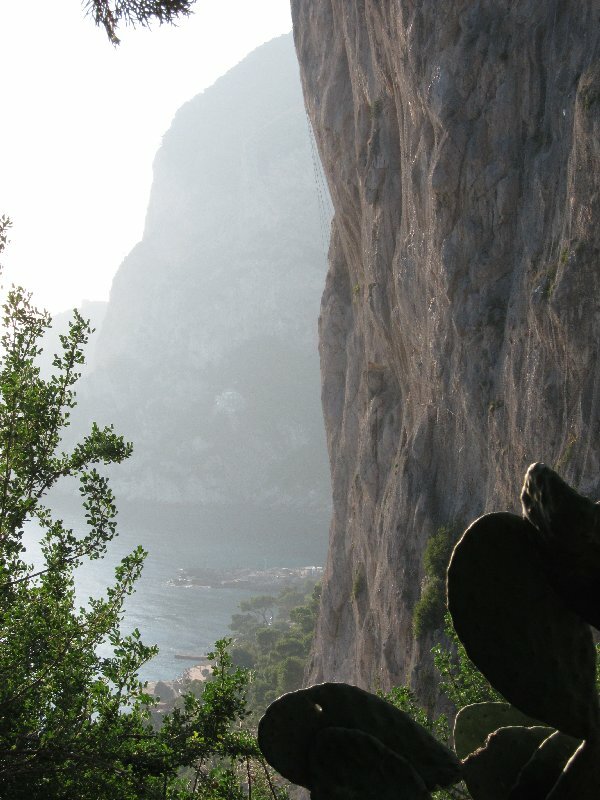 Capri is probably best known for its faraglioni: two spectacular rocks emerging from the sea and reaching up towards the sky. The view is timeless. 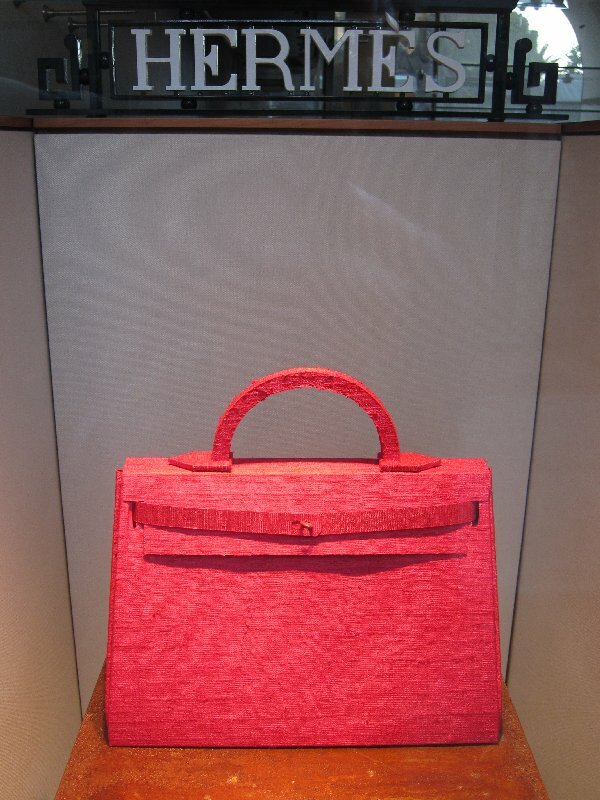 At each hour of the day and from various spots on the island the faraglioni always have a slightly different look. As you walk along the pathways of the island you come upon immense cliffs and rock structures that reach to the sea and nearly obscure your view of the sky. 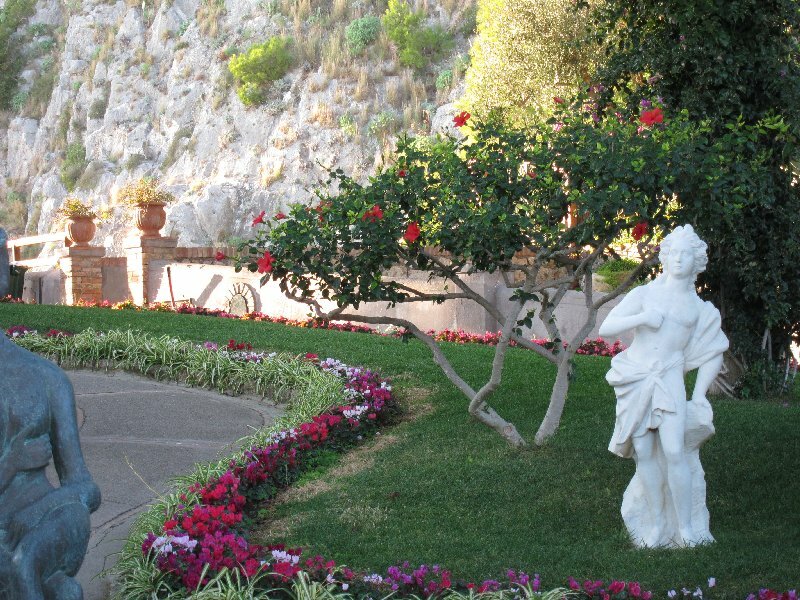 Capri is full of amazing gardens, replete with flowers and sculptures; this one is part of the Augustus Gardens on Via Krupp. The villas you encounter along the way are each one different from the next, an explosion of color and varying architectural style. The red earth tones of this villa were accentuated by the piercing blue sky. 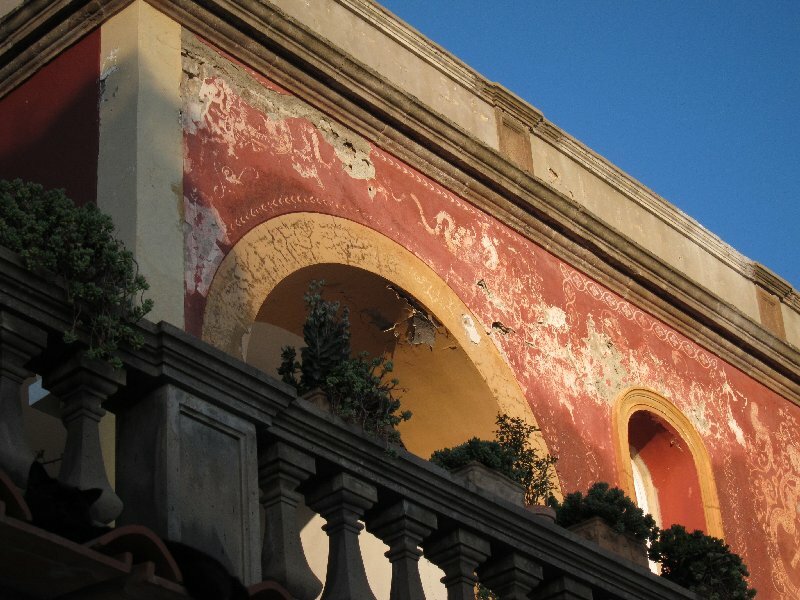 The villa was covered with simple frescoes, fading from the wear and tear of the elements. 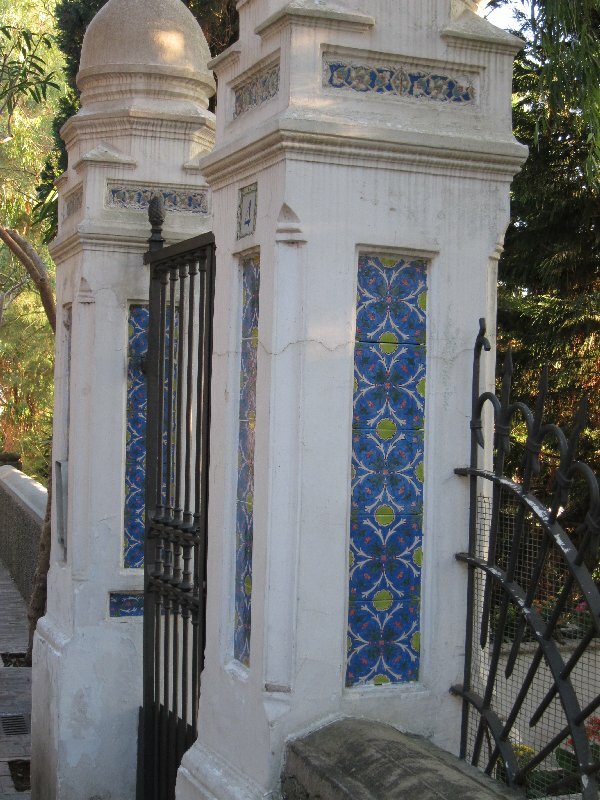 Many villas are white and often incorporate the characteristic ceramics of the Campania region, mostly coming from Vietri. 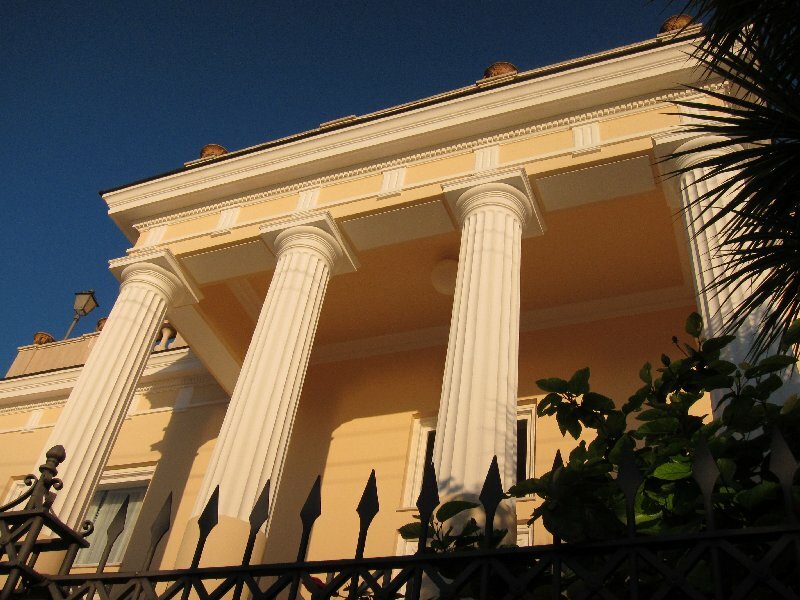 A creamy white and beige columned villa, again gorgeous against the deep blue sky. 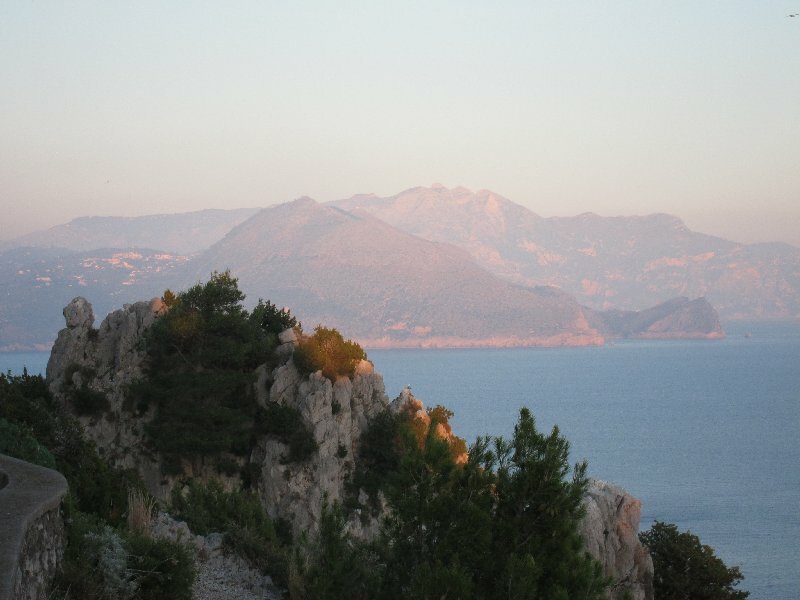 Once we’d rounded the island and the day was coming to an end we came upon a view of the Amalfi coast, off in the distance. 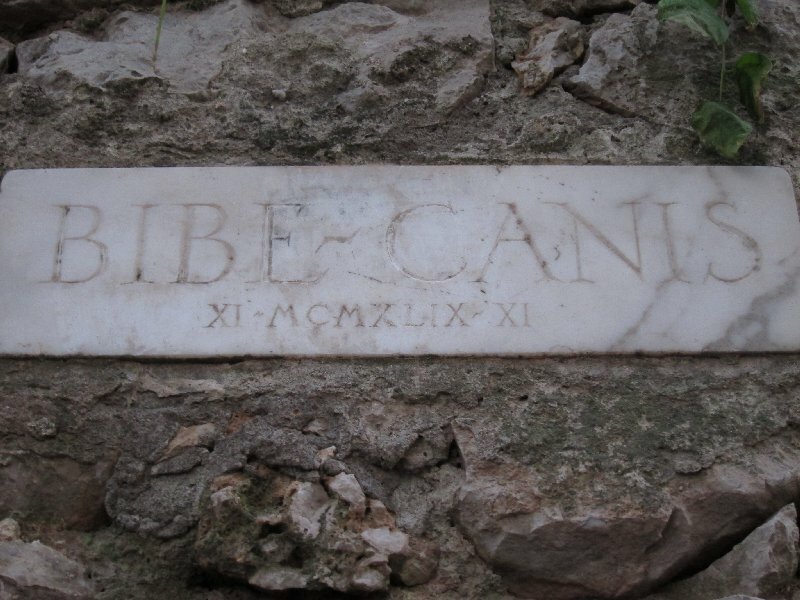 Some kind soul, probably a dog-loving villa owner, had created this watering hole for dogs, with a marble slab indicating the spot, in Latin: Bibe Canis: i.e. 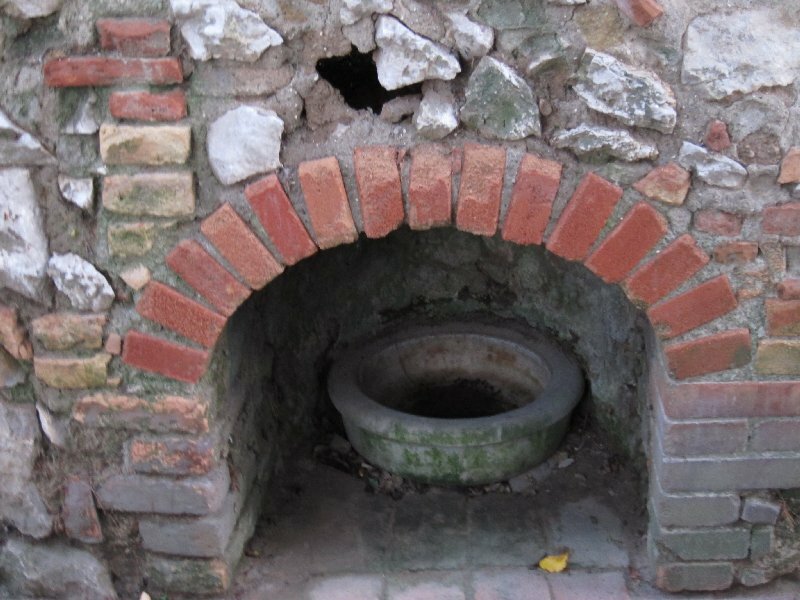 place for dogs to drink. By this time in our hike, well over an hour from town, there was no source of water in sight and the stone water bowl was bone dry.